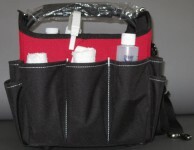 Medical Clean-Up Kit is for spills, wiping down surfaces, floors, and is great for offices, sports events, home, industrial settings, and vehicles. (Size 15" long, 8" Wide) Includes: SaniZide Germicidal Solution, Disinfectant-Cleaner-Deordorizer for Virucide, Tuberculocidal, Fungicide (against pathogenic fungi). This kit comes with other items listed. Sanizide plus is a convenient, fast-acting, multi-purpose, broad spectrum disinfectant and deodorizer for environmental surfaces. Our alcohol-free formulation is a non-corrosive, EPA registered, quaternary ammonium compound effective against TB, HIV, Hepatitis A, B, & C, Mrsa, Vancomycin Intermediate resistant Staphylococcus Aureus (Visa), Vre, and more! Sanizide plus helps you comply with the OSHA bloodborne pathogens standard, which requires the use of an intermediate level (tuberculocidal) disinfectant where gross contamination is known to have occurred. 32oz spray bottle. Sani-cloth plus disposable wipes are an EPA registered hospitalgrade disinfectant to accommodate the many situations and hard non-porous environmental surfaces found in healthcare settings. Sani-cloth plus kills bacteria and viruses including TB (Mycobacterium Bovis); Hepatitis B (HBV); Hepatitis C (HCV); HIV-1; Herpes Simplex Yype 2; Methicillin resistant Staphylococcus Aureus (MRSA); Vancomycin resistant Enterococcus (VRE); Influenza A2/Hong Kong; Escherichia Coli (E. Coli); Pseudomonas Aeruginosa; Salmonella Cholerasuis; and Staphylococcus Aureus. low alcohol formula (14.85%). large tub.